Wouter Dekoninck studied organ and harpsichord at the Lemmens Institute in Leuven and, after numerous masterclasses in Belgium and abroad, obtained his specialization diploma with the highest honours. He regularly performs as a soloist and improviser at international organ festivals with or without his own transcriptions for the organ. Alongside these appearances, he collaborates with vocal and instrumental ensembles and participates in recordings for the radio and television. He has been the conductor and musical director of many orchestral and choir projects including Schütz’s Musikalische Exequien, Purcell’s Dido and Aeneas, many of J.S. Bach’s cantatas and his Christmas Oratorio, Haydn’s Paukenmesse, Mozart’s Requiem, Brahms’ Ein deutsches Requeim and Mendelssohn’s Paulus Oratorio, all performed on period instruments. In chamber music settings, he has close ties with Ann Cnop (baroque violin) and Marian Minnen (baroque cello). 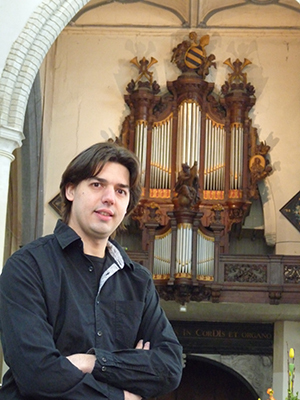 He is the head organist of the wonderful historical Penceler Organ (1714) of St. Gertrude’s Church in Leuven. He also teaches organ and harpsichord at the music schools in Halle, Lennik and Sint-Agatha-Berchem. With his baroque ensemble the Hildebrandt Consort, he focuses on late baroque works, including those by J.S. Bach in particular, mostly in chamber music formations. Under his guidance, the Hildebrandt Consort has developed a unique, refreshing sound and an exceptional repertoire based heavily on new works composed by Wouter and his transcriptions of baroque music for organ and orchestra that retain the spirit and style of the original composer. Thus the ensemble proposes a completely innovative approach to the world of baroque (early) music.